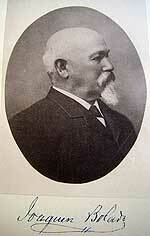 1871-02-03: MacDougall, Arques and others sold Ranchos Quien Sabe & Las Aguilas to De Laveaga. Friday, February 3, 1871 – Frederick A. MacDougall, Joaquin R. Arques and other owners sold Quien Sabe and Las Aguilas ranches for $180,000 to José Vicente De Laveaga. Arques JR to Laveaga, JV de. In “East of the Gabilans,” the records indicate that it was sold in 1875. The book also says that owners of record were Frederick & Francesca MacDougall, A. Calderon, Mercedes Calderon, Pedro Baca, and Joseph Estrem. Source: Marjorie Pierce’s East of the Gabilans, p. 117. Pierce, Marjorie. “East of the Gabilans” Valley Publishers, c 1976 Library of Congress: 76-56566. ISBN: 0-913548-39-1.